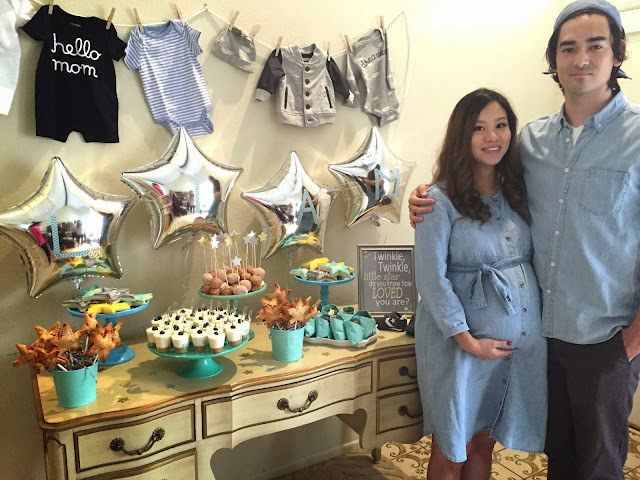 My friends and soon-to-be parents, Pauline and Eugene are a few weeks away from welcoming a baby boy into their family. 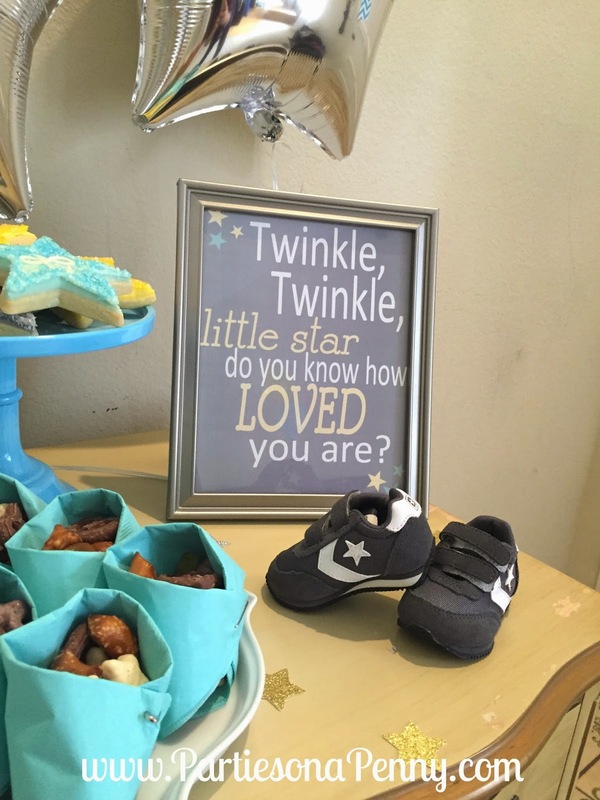 To celebrate this joyous occasion, we hosted a Twinkle Twinkle Little Star themed baby shower at their home. Here are the details of the dessert table I created for baby Liam's pending arrival for under $100. 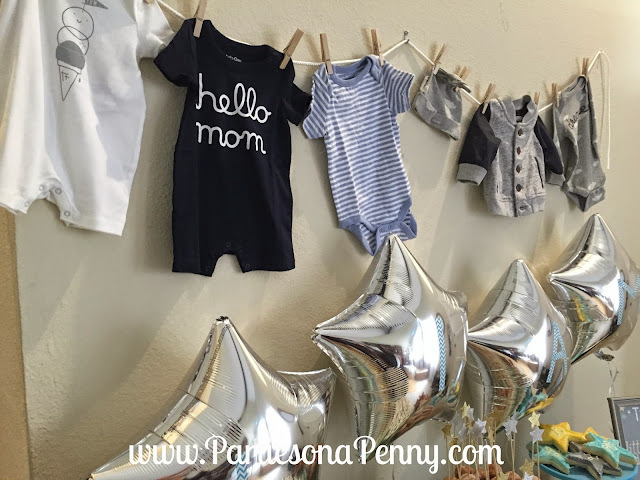 I love hanging baby clothes as part of the decor for a baby shower. 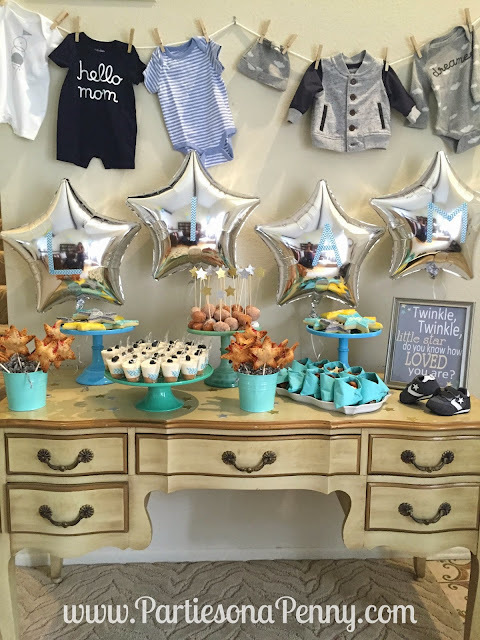 The clothes are not only cute and easy to acquire, but also make great "decorations" to any space/table. 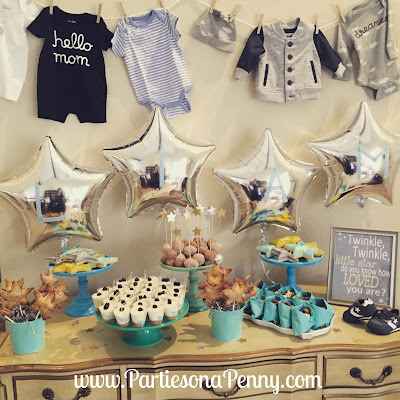 To go along with the star theme, I purchased these star mylar balloons from Party City and then used blue washi tape to spell out Liam's name. Usually, I would make these sugar cookies from scratch, but to save time I used a Groupon where I was able to get a dozen custom sugar cookies for $18. 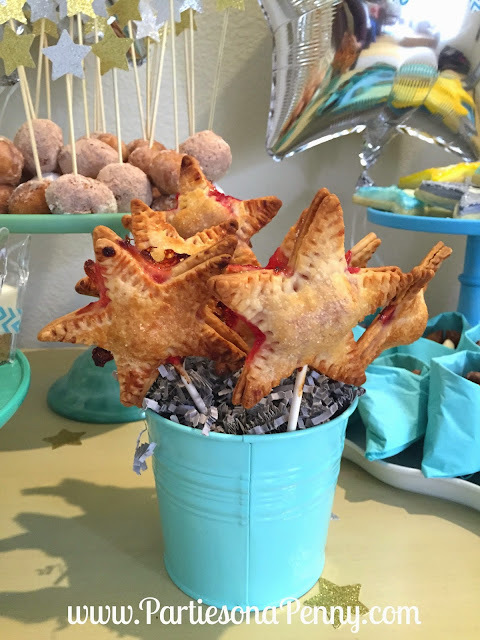 To create these pie pops, I followed THIS recipe, but used a star shaped cookie cutter to go along with the star theme. You will also need 2 boxes of pie crusts not 1 to make a dozen star pie pops. This recipe is so easy to make and what is even better is that there is no baking involved! I also loved that I was able to make these the day before by freezing them. I used 2oz plastic shot glasses that I found at Party City (100 for $8). 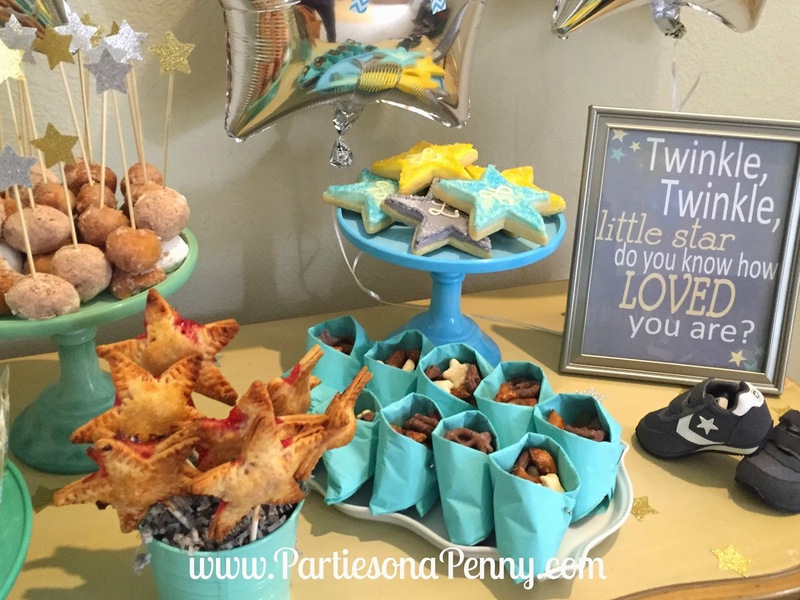 For the crust and filling, I used THIS recipe and was able to make about 2 dozen shooters. I topped each shooter with fresh blueberries. I also taped (blue washi tape) a mini spoon which I found at Daiso (50 for $1.50) along with each shooter. 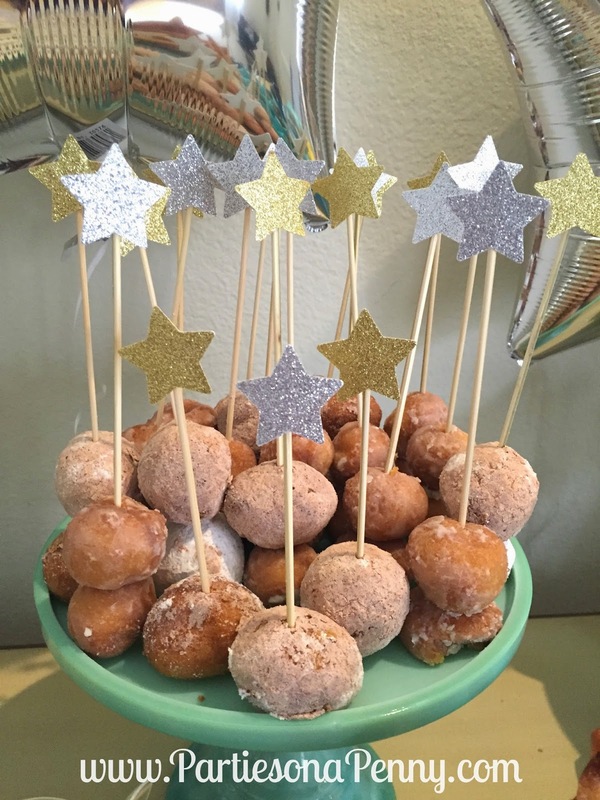 To make these star skewers, I cut out stars using a star punch and glitter scrapbook paper and then glued them to the ends of a wooden skewer. These donut holes were store bought. 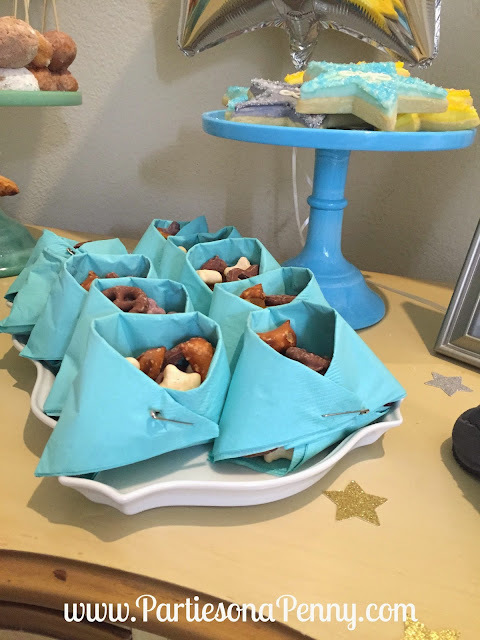 To make these "diapers" I used blue paper napkins and THIS picture tutorial and sealed each one with a safety pin. I filled each diaper with chocolate covered pretzels and candies from Trader Joes. I am so excited for these parents-to-be and I am even more excited to meet baby Liam! 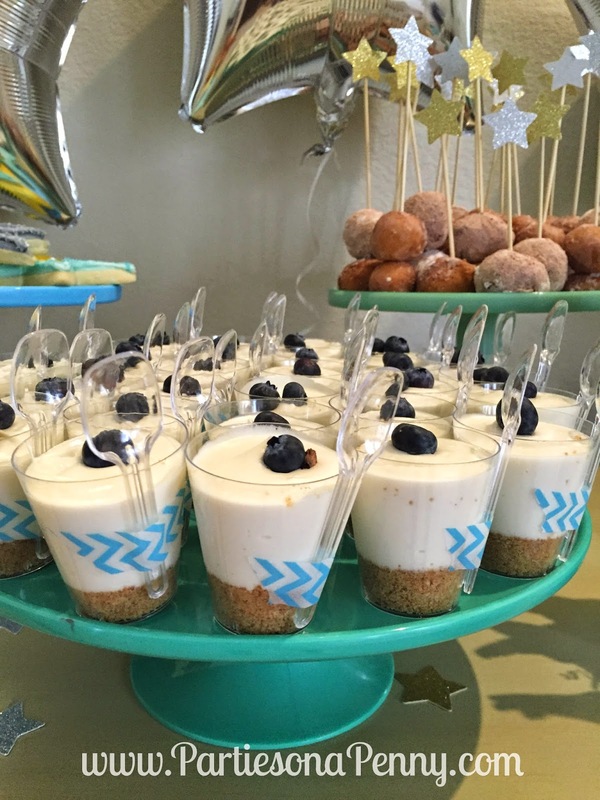 Where is the recipe for the blueberry cheesecake shooter? Twinkle Twinkle Little Star is the most pleasant and delighting poem for children.It also reminds me of my childhood days.thank you very much for sharing.keep posting.